Another casualty was Tournament Manager Roger Staples who was called away for some CA business in Cheltenham on the day. Derek Johnson stepped into the breach and was able to recruit a further 7 players from his two clubs Belsay Hall and Tyneside. The twelve entrants had been drawn into two American blocks of six by Roger with placings in the blocks playing a final play-off against their counterparts from the other block. Block A finished in a three way tie at the top with John Fitzpatrick, Marcia Henderson and Brenda Johnson all finishing with 6 points from their 5 matches with Marcia beating John, John beating Brenda and Brenda beating Marcia. John Fitzpatrick emerged as the winner, Marcia second and Brenda third, not on alphabetical order(!) but on net points. Block B was a simpler affair, just a two way tie. Sandra Cornes’ 7-5 win over Dave Okell in the last round of matches was enough to pull her level with Dave on points and, of course, sent her through on the who-beat-whom first tiebreaker. The play-offs saw Sandra Cornes take full advantage of her last gasp qualification at the top of Block B by overcoming a 3 point handicap difference in experience to beat John Fitzpatrick 7-5. She now progresses to the national final in Nottingham at the end of September. 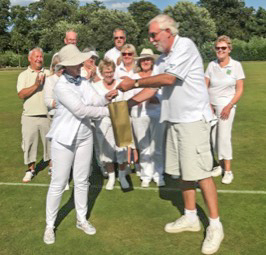 Third place in the tournament went to Dave Okell who has only been playing for two months who beat Marcia Henderson, and another 3 point handicap difference, 7-2. Brenda Johnson claimed 5thspot in winning 7-2 against Sue Caygill. 7thwas Sara MacPherson who just squeezed home 6-5 against Colin Chun. Izzy Poyntz took 9thwith a 7-3 win over another novice, Alison Okell, and May Hall beat Jean Thompson 7-4. Satisfyingly everybody said they had enjoyed what was, for most, a first foray into tournament play and the whole experience doesn’t seem to have put anybody off for life! 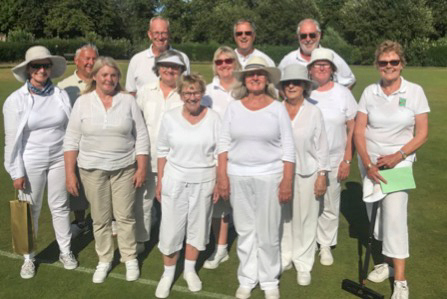 There are still two excellent regional opportunities for other NW Fed Golf Croquet players to qualify for the National finals – Bury on Wednesday 25th July (contact Paul Kenworthy) and Southport on Friday 10th August (contact Don Williamson). 2018 C Golf Players at Middlesbrough – From left to right: Sandra Cornes, Dave Okell, Alison Okell, John Fitzpatrick, Izzy Poyntz, May Hall, Marcia Henderson Colin Chun, Brenda Johnson, Jean Thompson, Derek Johnson, Sue Caygill and Sara MacPherson.